Remember - most of these images are merely thumbnails...don't forget to CLICK on 'em to see things the way they really are! WEIRD WEDNESDAY - The True (?!) 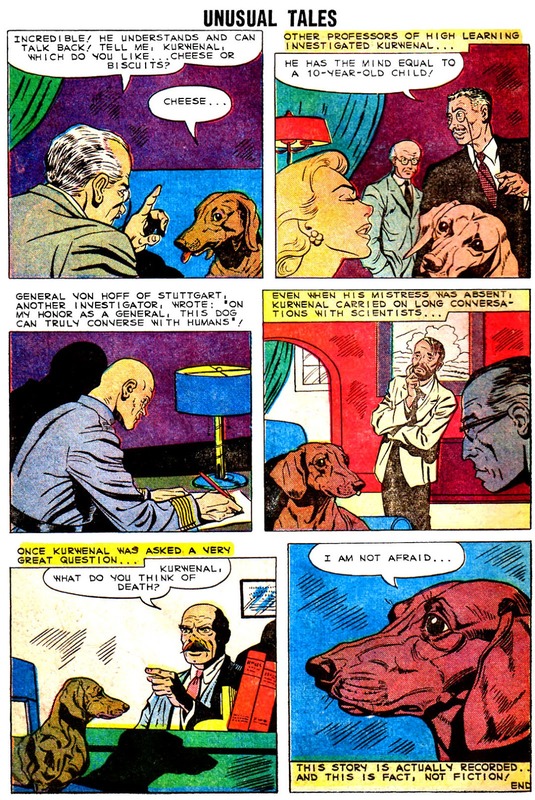 Story Of "THE TALKING DOG"! 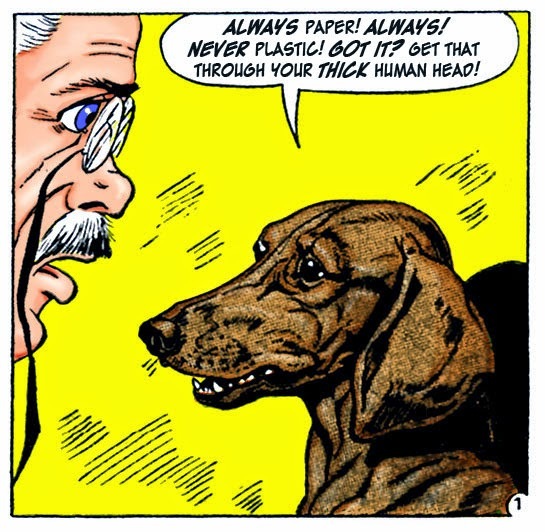 Today's story comes from Charlton's UNUSUAL TALES #17, 1959. 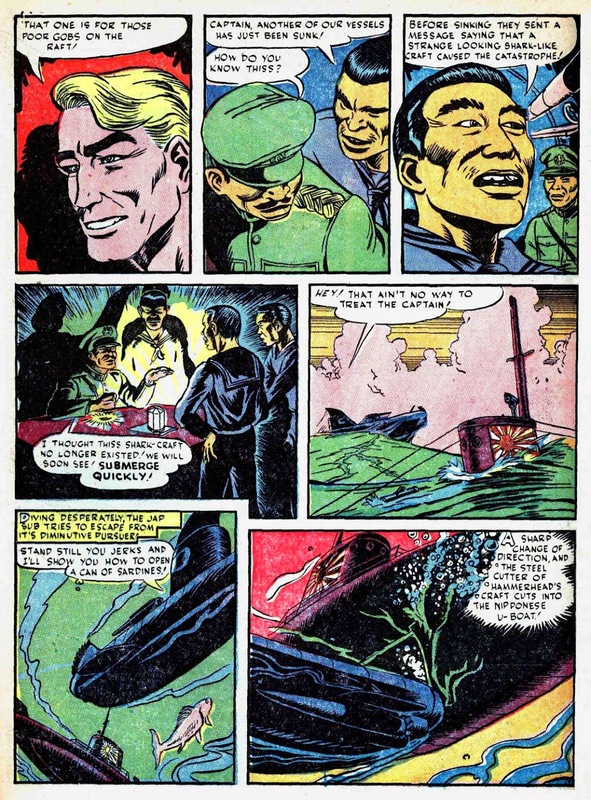 When I first read this short comic story I was taken aback a bit by it's oddness, then by the strange content and imagery in the final panels, and then, finally, by it's bizarre claim that the story is true! Well, of course I had to look into that claim deeper. Soooo, this can't be real, right? 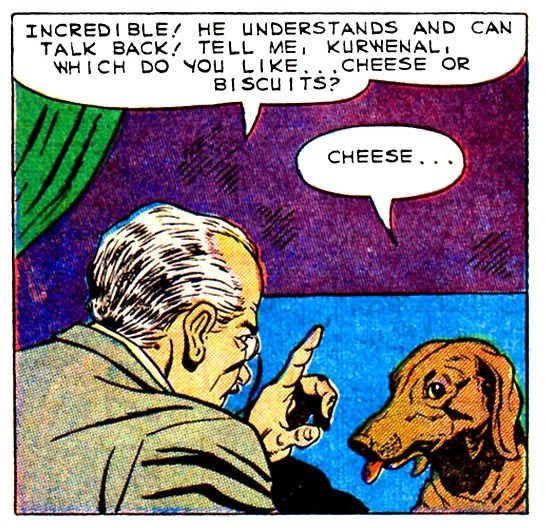 Instead, why don't you ask Kurwenal? First of all, yes, it's true, apparently there were some real dogs that were allegedly trained to communicate. 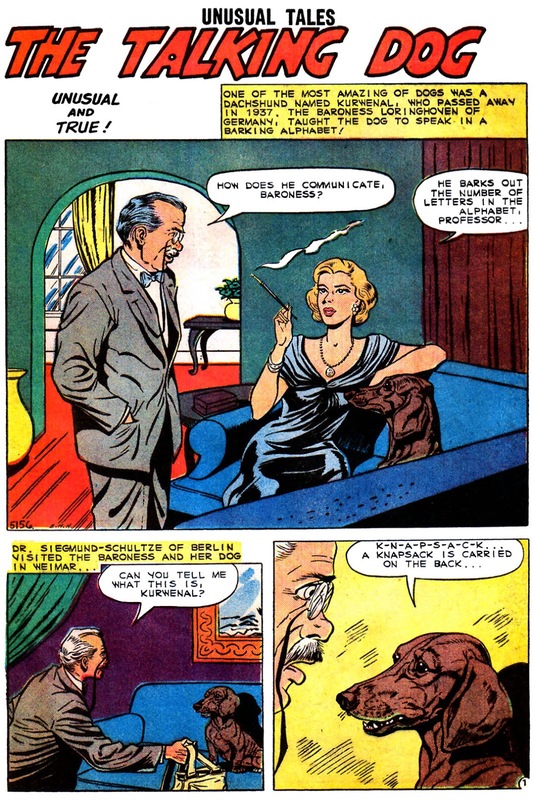 They didn't communicate vocally, so the comics word balloons are slightly misleading. They communicated (allegedly) by spelling out words through barking or tapping their feet in an alpha-numeric code. For example, the word cab, C-A-B, would be (as "spoken" by Kurwenal) bark bark bark - bark- bark bark! Get it? Sure you do! 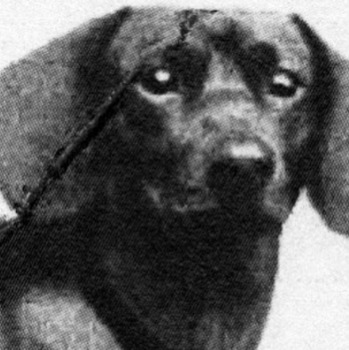 You can read for yourself some of the weird claims about these weird dogs by clicking on these weird links! I did some more research and discovered there was so much more that this incredible and weird doggie said during it's life, and below I have recreated some of these astonishing and weird utterances! The things that pass through a dog's mind! 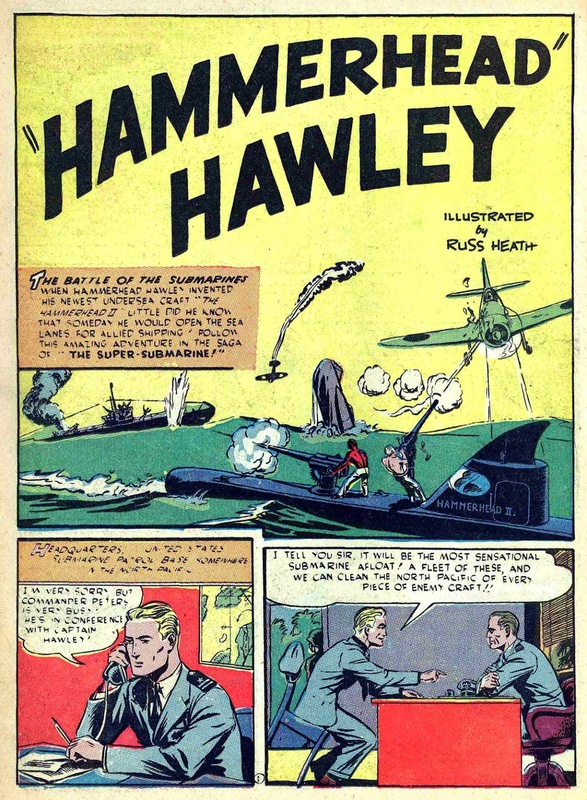 Russ Heath's 1st Comic Book Art - "HAMMERHEAD HAWLEY"! 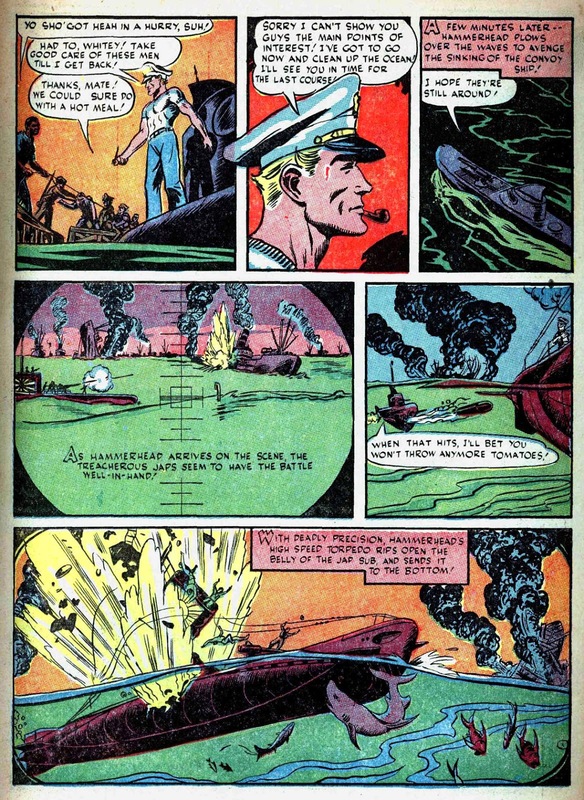 Russ Heath is certainly one of the most well respected and talented artists ever to draw comics. 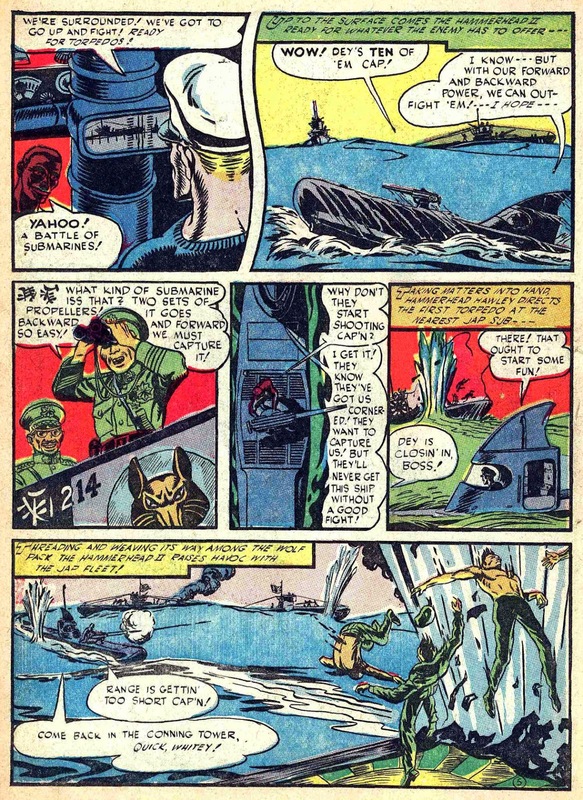 Even the greatest artists have to start somewhere, and today we will look at the first comic book art ever created by Russ Heath! The year is 1942, and Russ heath is only 16 years old, still in high school! 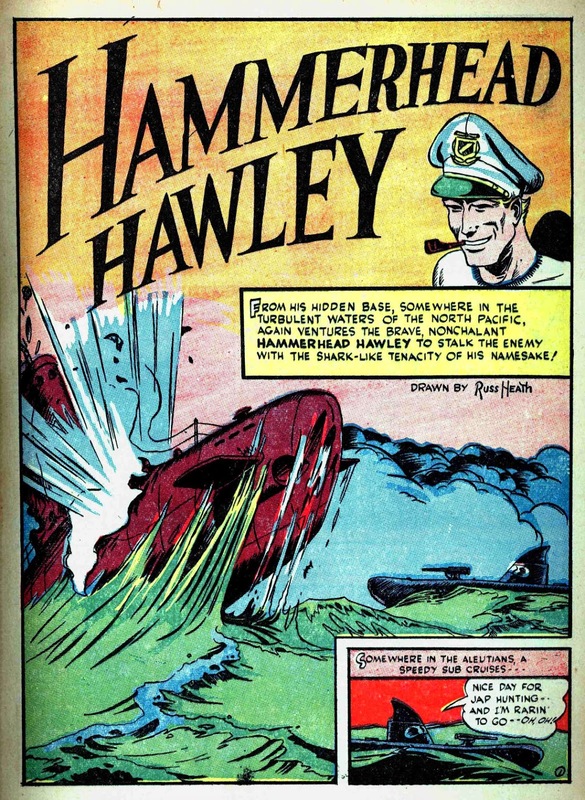 He manages to get a freelance job working for Holyoke Comics, drawing a character called "Hammerhead" Hawley. 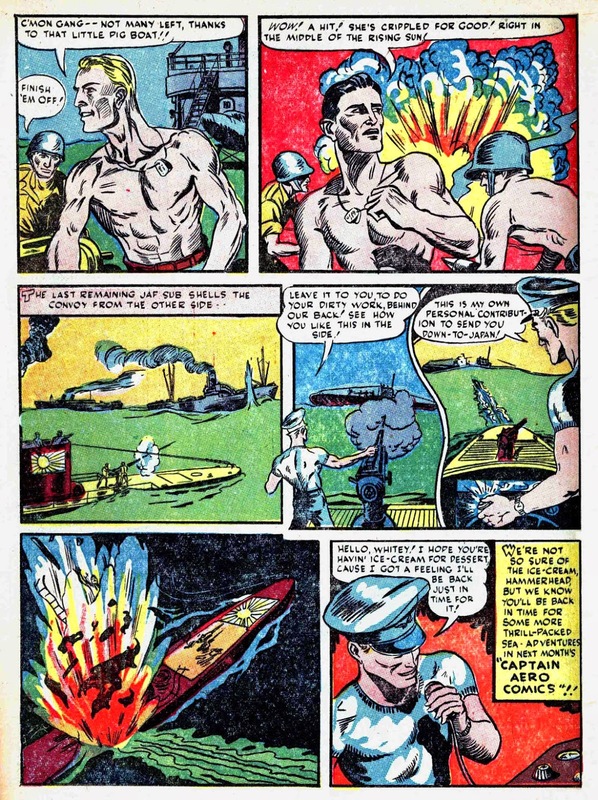 The feature appeared in CAPTAIN AERO COMICS #8, 9, 10,11, 13, and 14 between 1942 and 1944. 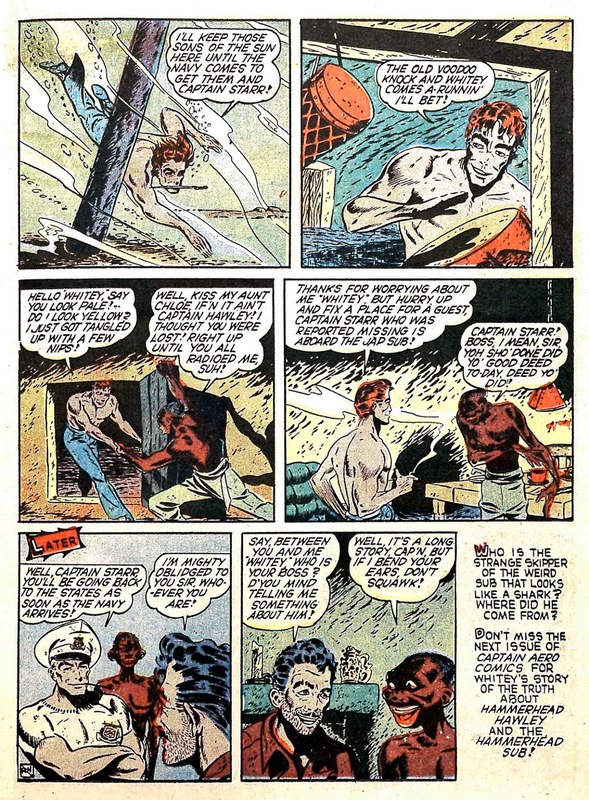 According to russheath.com and wikipedia sometimes Heath would be inking over the pencils of artist Charles Quinlan, but at least 2 or 3 times Heath did the art chores entirely by himself. 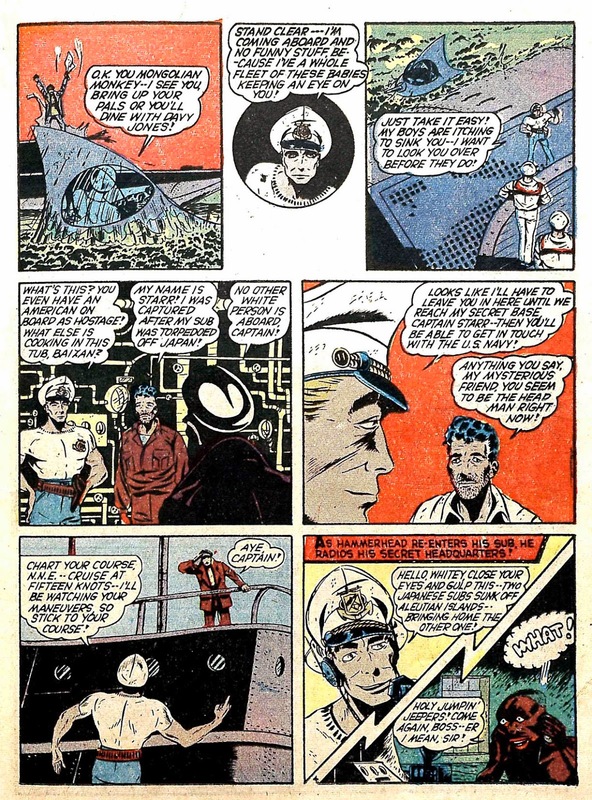 Those are the stories we will look at here today, from issues #8, 13, and 14. 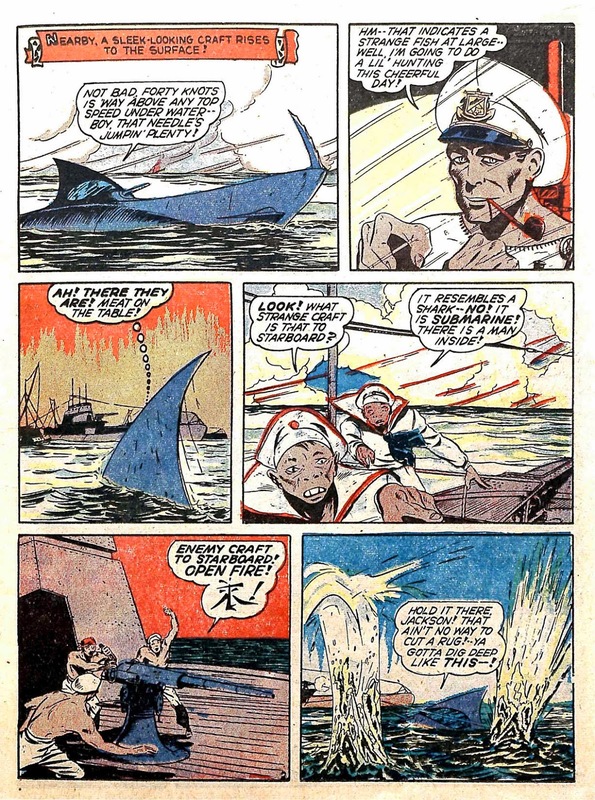 The artwork in the other "Hammerhead" Hawley stories is likely Heath on inks, and does not quite match up to these Heath solo ventures, especially the last two stories which are clearly signed by Heath. The art in these stories give a glimpse of the future greatness that is to come. 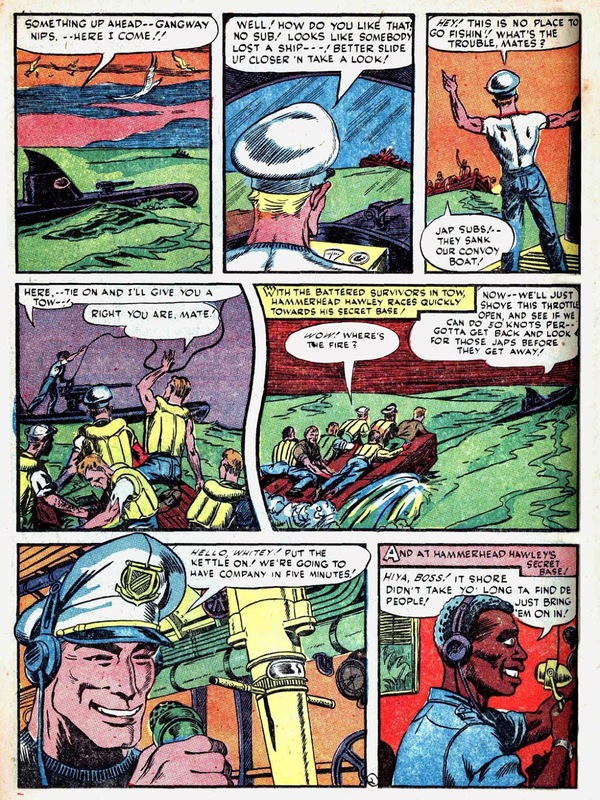 Heath went into the Air Force at the end of high school and in 1947 began his career in earnest at Atlas/Marvel Comics, and would later become one of DC Comics highest esteemed war comics artists. 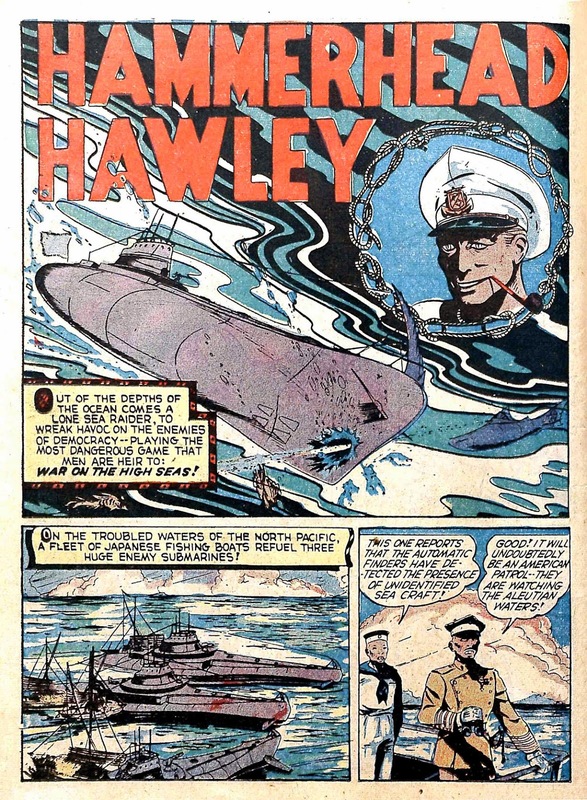 The above story marked the initial appearance of "Hammerhead" Hawley, and according to wikipedia and the GCD (which may or may not be accurate) was entirely by Heath. There does appear to be the initials R.H. on the last page, and we can presume that Heath did ink the story at the very least. 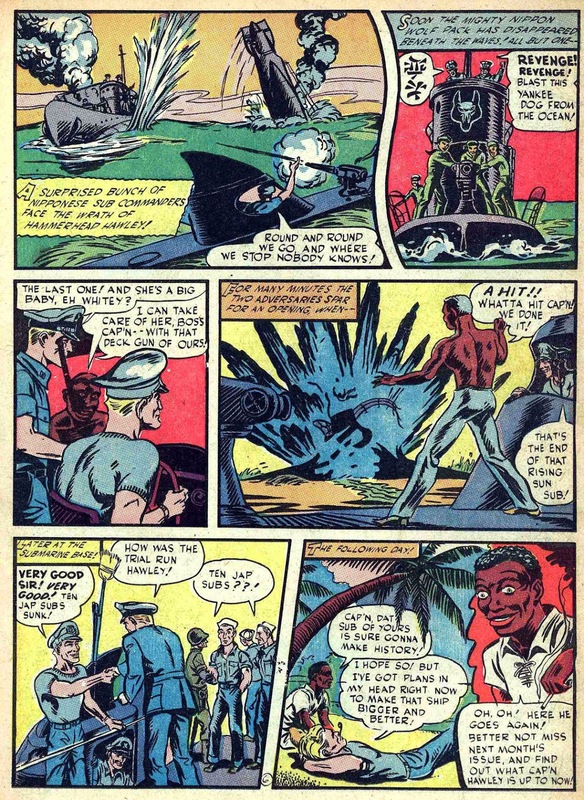 If not entirely representing the familiar Heath art style, there are certainly elements to suggest that his hand, however young and inexperienced, was involved. 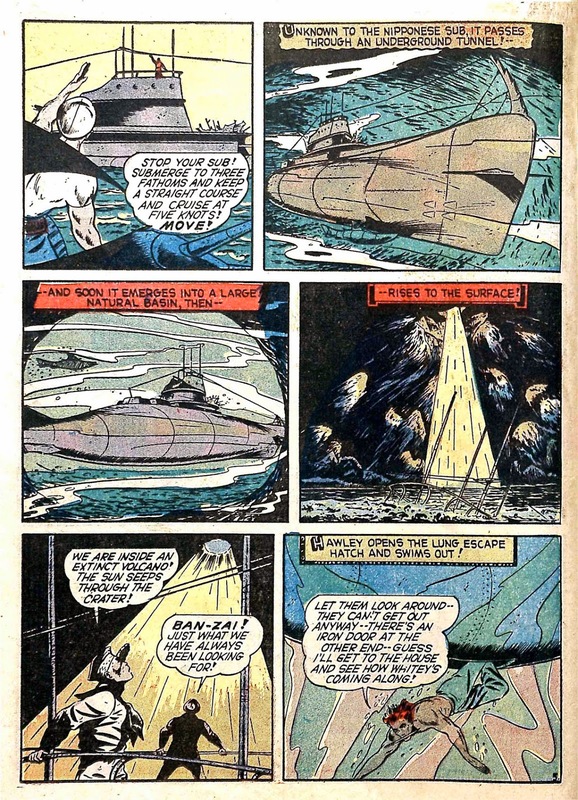 The following two stories mark the final two appearances of "Hammerhead", and seem to be clearly identified on the splash page(s) as being illustrated by Heath alone. This same conclusion can also be drawn by the trained artistic eye, as the familiar Heath style is becoming more strongly evident. 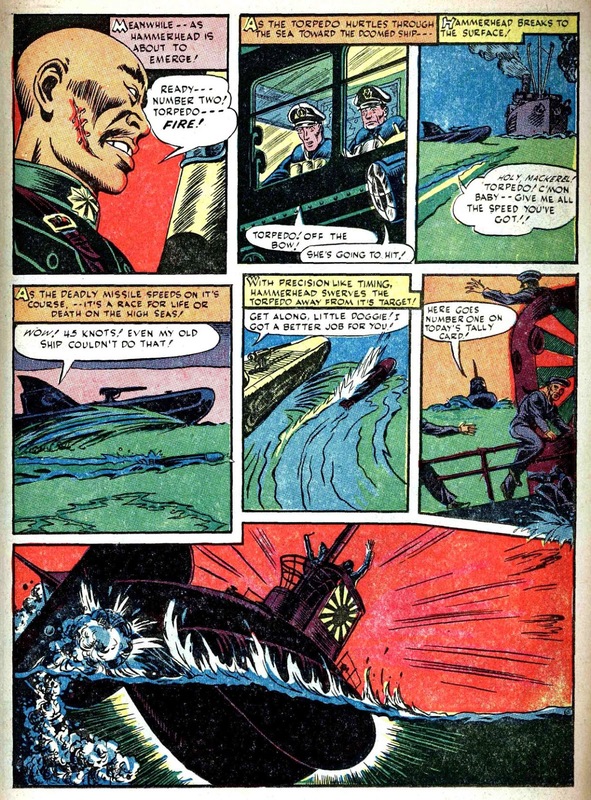 These last two stories do show a definite improvement in the young artists abilities beyond those shown the first story. Pretty darned good for a kid still in High School, huh? Welcome! Here we will explore the wonderful world of Comic Books. 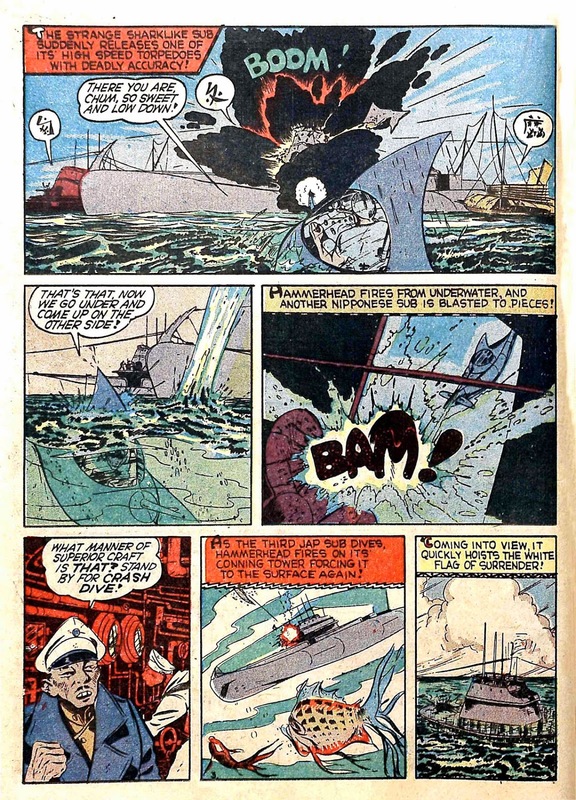 A comic book can enjoyed by anyone, young and old alike, and for many different reasons -- you may be captivated by the story, the art, or both. There have been so many different kinds of comic books, and here we hope to celebrate all of them in one way or another. 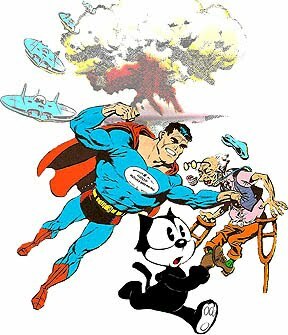 Together we can pull back the curtain and look at some of the legendary artists and writers, the comic book creators who have contributed to the art form over the last seven decades. We may look back even farther. You won't find the latest comic book news here, but you will find insights, information, and some of the greatest stories and art from some of the world's best comics. 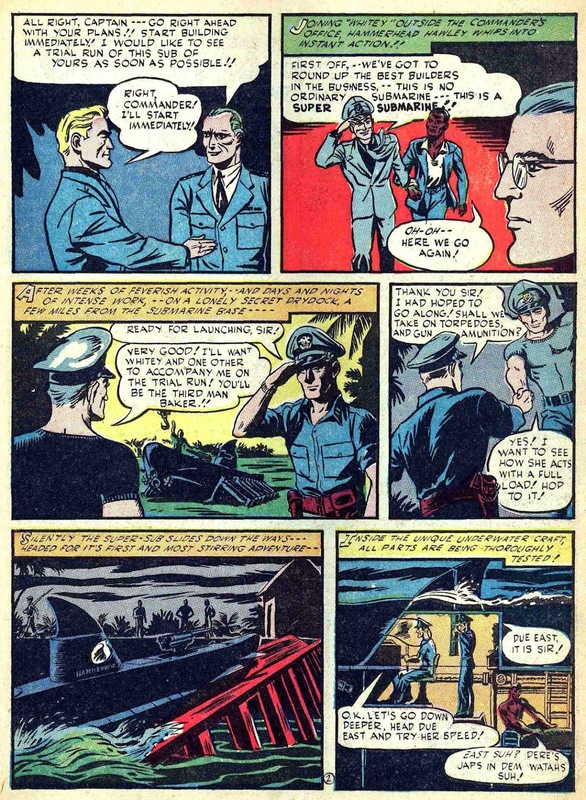 THE APOCOLYTE IS PRESERVING THE HERITAGE OF CLASSIC COMICS! 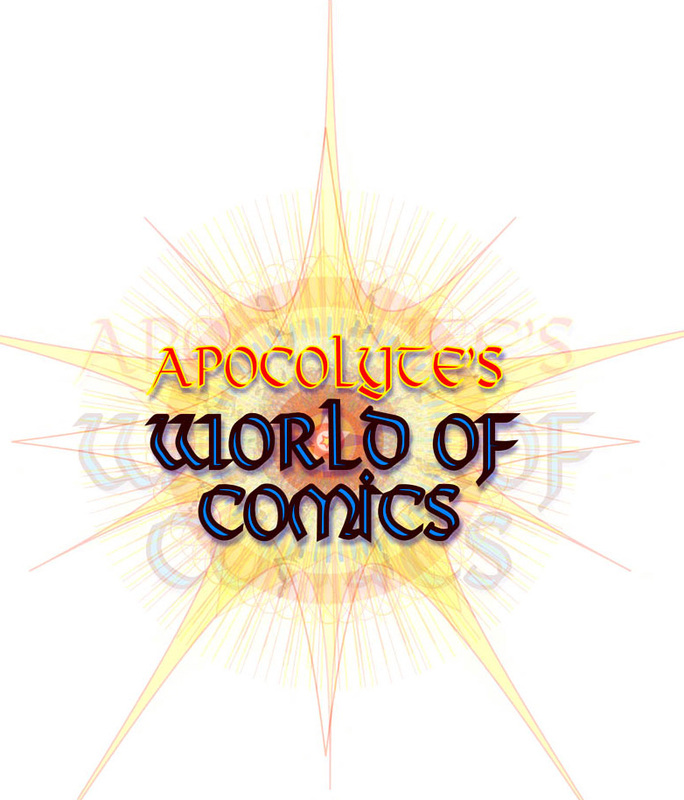 Digitally Restoring Deteriorating Artwork And Imperfect Comic Scans For Posterity And Your Enjoyment - Look For The Posts With This Graphic Logo! MY RECENT COMIC BOOK ERA POLL RESULTS! The Origination Of CROP CIRCLES - "THE HIDDEN HEX!" WAR: KILL OR BE KILLED - Atlas' "FIRST BLOOD!" 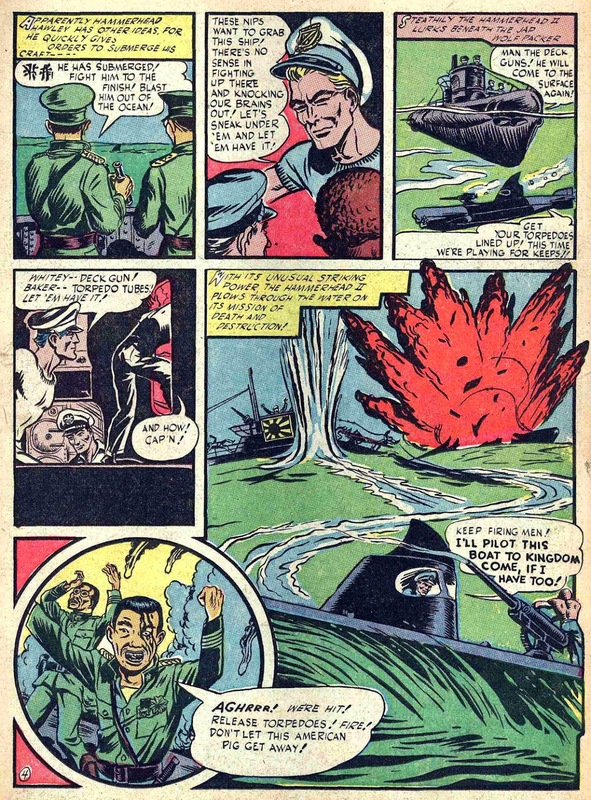 and EC's "ENEMY ASSAULT!" 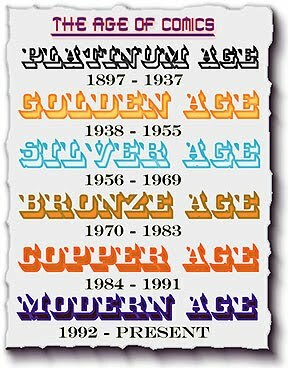 My Interview with PAPPY from PAPPY'S GOLDEN AGE COMICS BLOGZINE! APOCOLYTE'S LEAGUE OF THE ENLIGHTENED - Please Join Us! There are many great comics blogs and bloggers out there, and we all love great comics! 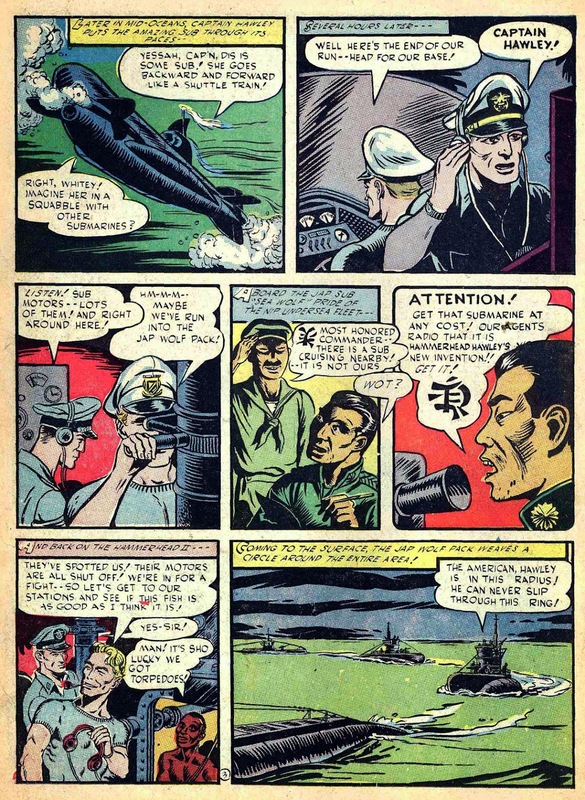 Therefore, it is natural that once in a while more than one blogger may post the same comic story. In the inevitable case that I may post a comic story or scan that has been posted elsewhere, let me state that it is not my intention to step on anyone's toes. If I feel a comic or a story is worthy of presenting, I will post it here. 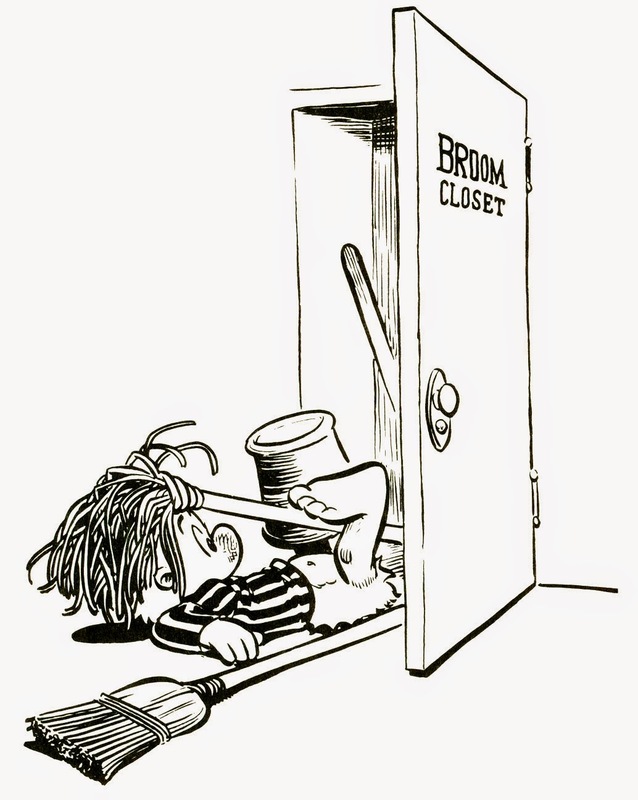 I do go out of my way to try and see if a certain comic I want to post has been posted somewhere else already, and if it has, I generally do not post it here. If a lot of time has passed, I am more inclined to post a duplication. I definitely promise that I do not take scans from other bloggers posts to use as my own - the stories I post here are my own scans and my own collection, and the words written on this blog are entirely my own (unless noted). 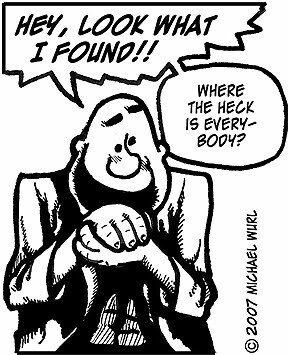 In this digital age some of my present collection is now digital scans and not hard-copies of comics, though many are my own actual comic. Some scans are donated to me. 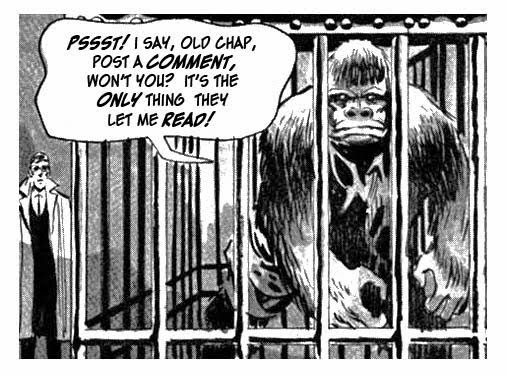 When I began blogging comics I asked another well-known comics blogger if he would mind if I posted a story that I liked even though he had already posted the same story before. He told me, "Go ahead and post it. If it was worth posting once, it was worth posting again." I thought those were wise words, and I still believe that now. So, to the comics blogging community, let us post what we want and enjoy each others vision and point of view, without malice. If we happen to post the same story by coincidence, so be it. If you see something here and you want to post it, all I ask is give credit where it is due. We all share one thing - WE LOVE COMICS! CRIVENS! 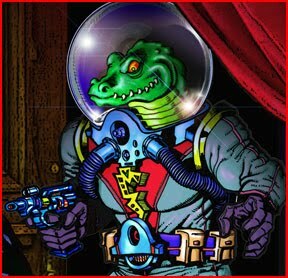 COMICBOOKS, CARTOONS, & CLASSIC COLLECTABLES! HOME OF THE FINEST BLACK AND WHITE STORIES AND ARTWORK! DR. WERTHAM P. FREDRICS HAS HIS OWN BLOG NOW! VISIT HIM! 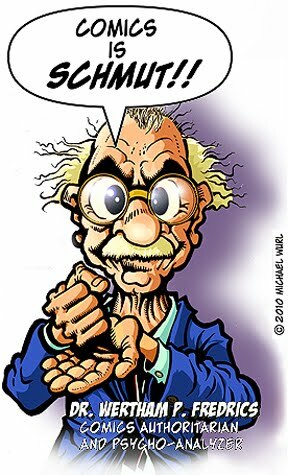 LIFE, DEATH, COMICS AND MORE...WAITING AT THE BLOG AT THE END OF TIME! THIS COMICS BLOG RECOMMENDED BY COMMANDER ZORG HIMSELF! THE FLIGHT OF THE APOCOLYTE! ENJOY THIS BLOG? PLEASE DONATE! 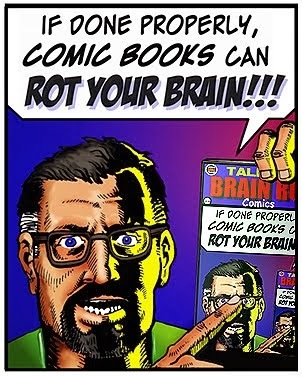 HELP PRESERVE THE HERITAGE OF COMIC APPRECIATION! THANK YOU! ALL COMIC SCANS ARE SHARED FROM MY PERSONAL COMIC BOOK COLLECTION, OR DONATED GENEROUSLY BY COLLECTORS, UNLESS OTHERWISE NOTED. ALL IMAGES PRESENTED HERE ARE OFFERED AS A CELEBRATION OF THE TALENTED ARTISTS, WRITERS, AND CREATORS OF THE ARTFORM, AND WITH ALL DUE RESPECT TO THE RIGHTFUL OWNERS. IT IS WITH THE BELIEF THAT THESE TREASURES DESERVE TO BE HONORED, LOVED, SHARED, AND ENJOYED, AND WITH THAT GOAL IN MIND, IN CONJUNCTION WITH COMIC BOOK LOVERS EVERYWHERE, THAT I THEREFORE OFFER THIS SERVICE FREE OF CHARGE. 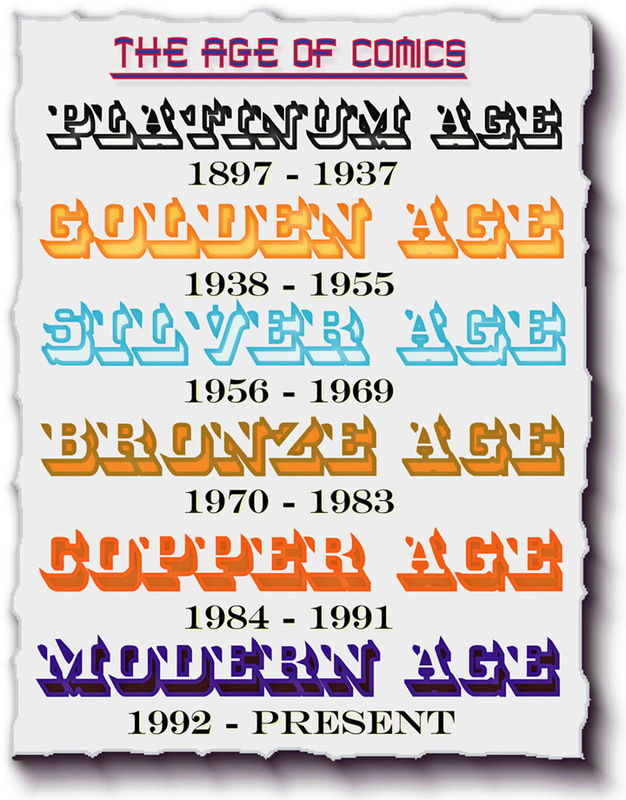 ALL IMAGES ARE OWNED AND COPYRIGHTED 2014 BY THE RESPECTIVE HOLDERS, AND ARE PRESENTED HERE FOR EDUCATIONAL PURPOSES WITHIN THE "FAIR USE" TERMS OF US CODE: TITLE 17, SEC. 107.